Some saw them as heroes, others as fools. Either way, trail-blazing railway pioneers had courage in abundance and were rarely thwarted by the undulations of our landscape. Valleys were crossed by embankments or bridges. Hills were cut or tunnelled. And, in between, the permanent way would cling to the contours like a politician to power. So states conventional wisdom. A queue of wagons wait at Sheep Pasture top, before descending the incline. But Josias Jessop discarded his engineering manual as he fashioned plans for a link between the Cromford Canal, built by his father William, and the Peak Forest, a creation of Benjamin Outram. These two waterways served the industrial engine rooms of Lancashire and the East Midlands. Connecting them would speed the flow of Derbyshire coal and open up markets for cotton, minerals and other sundry goods. If the concept was sound, the reality proved daunting. Towering a thousand feet above the southern trans-shipment point at Cromford Wharf was the limestone barrier of the High Peak. With a canal across the moors impractical, an early ‘iron railway’ was proposed which, to reach its northern terminus at Whaley Bridge, would have to climb the hill and then descend it. Arguably Jessop Senior fathered the modern railway. In 1789 he brought together edged rail and flanged wheel on a line at Loughborough and, fourteen years later, opened the world’s first public railway in South London, with horses providing the motive power. 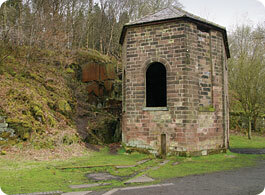 The 33-mile Cromford and High Peak Railway received Royal Assent in 1825. It was a triumph of ingenuity, featuring nine steep inclines and, at Gotham, an 80 degree curve which was the tightest on the railway network - just 55 yards radius. The estimated construction cost of £164,000 proved wildly inaccurate - a tradition faithfully carried on by today’s engineering companies - and set the tone for the line’s immediate financial future. 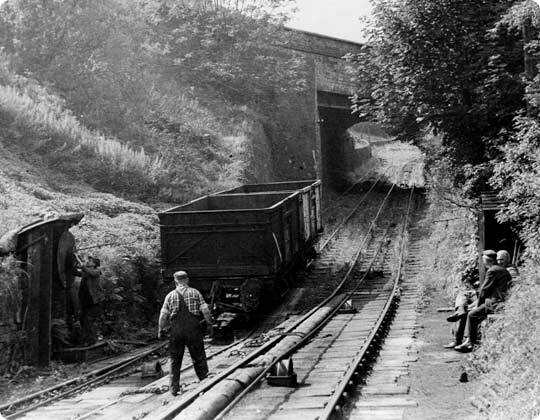 The 708-yard Middleton incline, pictured in 1930, as two loaded, descending wagons pass two empties heading up. Each incline was equipped with a stationary steam engine - to haul and lower the wagons - whilst horses did the donkey work on the flatter intermediate sections. It was not an express service. When the line fully opened in 1831, a journey from one end to the other typically took two days. Isolation was not-so-glorious for the C&HPR. Trade did not roar, certainly not loud enough to scare away the bean counters. Horsepower slowly retired, replaced by steam, but salvation truly arrived in 1853 when a connection was secured with the main line at High Peak Junction. Prospects brightened overnight. Quarrying companies gorged on local limestone and despatched it along the line to hungry, distant markets. There was a human cargo too, travelling in the brake van. Wheatcroft & Son, a Cromford coal merchant, offered a daily passenger service across the moorland plateau, though the inclines had to be tackled on foot. It was grim and unreliable, not least when footplate staff stopped to refuel in the Jug and Glass - a hostelry at Longcliffe. Lack of trade brought the shortlived service to a screeching halt in 1874. A contemporary view looking down Middleton incline from its midpoint. But the freight business blossomed and efficiency gains were sought. Cromford and Sheep Pasture Inclines were amalgamated to form a ¾ mile long plane with a gradient of 1 in 8. 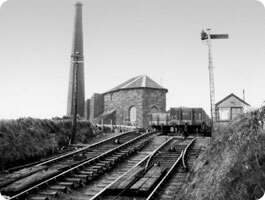 Hopton Incline entered the record books in 1887 when the stationary engine was withdrawn and, at 1 in 14, it became the steepest section of railway worked, without assistance, by conventional locomotives. And in 1892, with the London and North Western Railway now in charge, the line was diverted via a two-mile route into Buxton, rendering the original northern section - and its inclines - largely redundant. Upheaval surrendered to stability by the turn of the 20th Century. 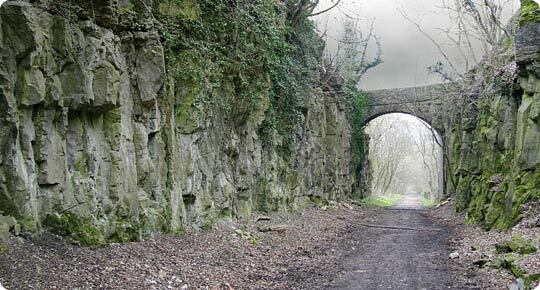 Traffic levels were consolidated and, during autumn and winter months, the line ran at capacity as local limestone - known for its purity - was guzzled by East Anglia’s sugar beet refineries. So life had a predictable routine to it when, in 1939, Hubert Doxey stepped onto the lowest rung of the railway career ladder, as engine cleaner and steam riser. Start at midnight and away by nine, six days a week with Sunday off. But each shift began and finished at Rowsley depot, an eight mile cycle ride from home. Despite his protestations, there was no dispensation when he was assigned a six-week stint at Middleton Top, a stone’s throw from his front door. “This is your bloody depot - you sign on here” insisted the foreman. Common sense prevailed after a couple of days. 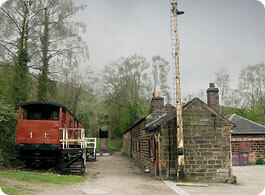 High Peak junction workshops, built in 1826, sit at the bottom of Sheep Pasture incline and are now a visitor centre. The day ran to a script written by the Traffic Inspector - an intricately woven plot featuring water, coal, stone and timber. Shunts here, run-arounds there. Quarry loads to marshal and weigh. Crippled wagons to sort. Down to the junction, return with empties. Drop off corn at Cromford Goods. The ups and downs of the incline. It was a mundane existence, offering little satisfaction and even less money. But laughs were plentiful. Hubert reported for duty one morning to find the engine shed was smokeless. The overnight cleaner, who should have prepared the loco, was barricaded in the cabin, adamant that he’d seen a ghost - “summat white with a clanking chain behind it”. A short while later, Sparrow Bond arrived from his nearby smallholding, looking for a goat which had escaped in the night. John Bell, one of the platelayers, wanted to look his best for the sermons on Sunday and asked the ganger to cut his hair, a service which he often provided in one of the wagons. An appointment was made for Friday. At the end of the shift, men used to ride up the incline on the last wagon - saving a hard walk - and half way through his trim the stationary engine driver rang down to say the final run was ready to go. Hubert witnessed the scene. “The ganger got up with old John Bell still in the chair - he’d only cut one side. ‘What about my hair?’ he said. ‘I’ll finish it on Monday! I’m not missing a ride up for the sake of the sermons.’"
North London tank engine 27505 sits at Cromford Goods by the weighbridge. Hubert travelled up the incline on the same run as Fred Warren, steam riser at Sheep Pasture Top, used to head down. On one occasion Hubert’s wagon came to a stand next to the catchpit, dug to stop runaways. He suddenly feared for his life, and Fred’s. “These wagons were coming down like hell - I’ve never seen owt move like them. The chain was flailing around like a whip and sparks were coming off. Sleepers were flying all over the place. I ducked down between the wagons as they hit the catchpit.” Concern for Fred’s welfare soon gave way to relief. Luck was on his side - he’d missed the ride. Runaways were rare but always spectacular. 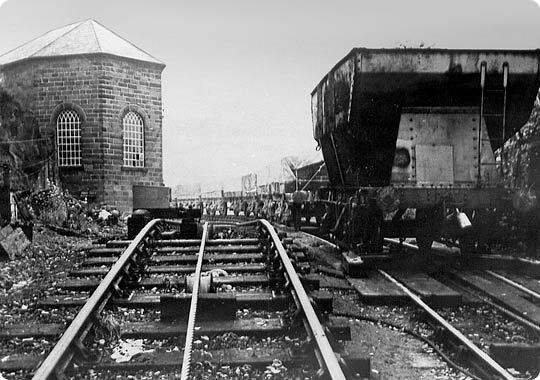 Shortly after dark on 1st March 1888 - before the catchpit had been dug - a chain broke with catastrophic consequences. A wagon full of lime and brake van containing gunpower hurtled down the incline, reaching a speed calculated at 120mph. At the bottom they derailed, launched themselves over the canal and disintegrated, scattering remains across the main line. Incline staff, no matter how diligent, were hostages to fortune. Wagons would arrive from the quarries and, prior to their descent, were fastened by chains to a continuous wire rope. But the knots could slip, lose tension or come undone. Denis Kay took his place under this sword of Damocles in 1955. 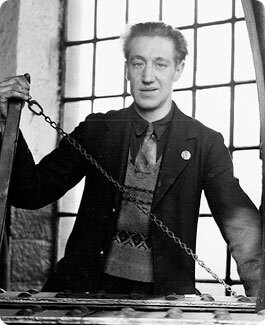 The first rung on his career ladder was as a ‘taker-off’ at Sheep Pasture Bottom - removing the chains and liberating the wagons for transit to High Peak Junction. Promotion followed to head shunter, taking charge of movements on the incline, and becoming a ‘hanger-on’. And so it went on. Eleven wagons from Killer’s Branch. Stone loads from Middleton Top. “It mainly repeated itself day after day. We’d start at half-past seven and, if everything went according to plan, it would probably be about a one o’clock finish.” Denis would fill his day by gardening, painting or decorating. Two empty wagons begin a run up Sheep Pasture. 1955 was a watershed year for the High Peak. Road transport was already eroding its business and, on 29th May, ASLEF called a strike which brought the industry to a standstill for over a fortnight. Eden’s new Conservative government quickly climbed-down but the damage had already been done. Hauliers held the quarries to ransom - demanding long contracts to move the stone - and when the strike was over, the traffic was no longer there. 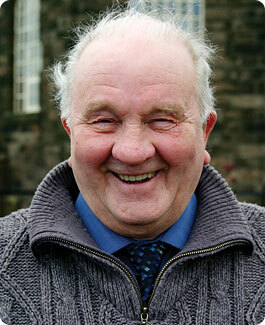 Denis moved to Rowsley in 1960 and, three years on, Middleton Incline disappeared from the map. Hubert was soon enticed away by the bright lights of Leicester and the thrill of driving on the main line. When the High Peak finally succumbed in April 1967, just one train a week was plodding across from Buxton, bringing the men’s wages. The stationary steam engine at Middleton Top once wound wagons up the incline and still performs on Sundays and Bank Holidays during the summer, albeit running on compressed air. He’s not alone. The trackbed now forms the 18-mile High Peak Trail, threading adventurers through the Derbyshire countryside and its many natural attractions. 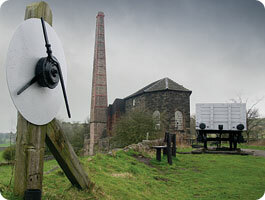 Middleton Top’s engine house is born again and this exceptional piece of industrial heritage has been designated an Ancient Monument. 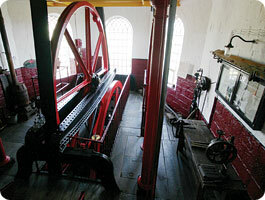 Inside, the original Butterley beam engine, dating back to 1829, still goes through the motions on Sundays and Bank Holidays during the summer. The Cromford and High Peak was at the cutting edge of a transport revolution, delivered by rail during the 19th Century. Wagons no longer rumble, but the inclines survive as a memorial to an era of great substance and the awesome resolution of those who built them.